An unaltered photocopy of your DD-214, or WD AGO 53-55, Special or General Orders, or other military issued document clearly displaying your award of the Joint Meritorious Unit Award. 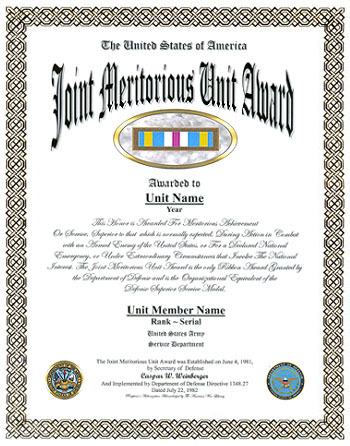 The Joint Meritorious Unit Award is an organization award. The JMUA is not an individual award. The JMUA is acknowledged to all members of a unit during time of award, and reflected on the personal DD-214, DD-215/Form 1577, or WD AGO 53-55. Only those members who served in the unit during the specific period of activity the JMUA is awarded for may apply for a display recognition bearing the veteran's name as well as the unit's name . That is, unit members who served before or after the specific citation dates of the JMUA award may not apply for a display recognition bearing a personal name, but may apply for a display recognition bearing the unit name. The Joint Meritorious Unit Award was established on June 4, 1981, by Secretary of Defense Caspar W. Weinberger and was implemented by Department of Defense Directive 1348.27 dated July 22, 1982 (as amended). C4.1.1. Unit awards recognize entire organizations for outstanding heroism or achievement performed during periods of war, international tension, national emergencies, or extraordinary situations that involve national interests. They are not intended to recognize single, individual actions, or the actions of a sub-element of a unit or organization, but instead to acknowledge the combined efforts of every member of a unit or organization. C4.1.2. Appendix 2 describes the U.S. unit awards that have been authorized for the Armed Forces of the United States. 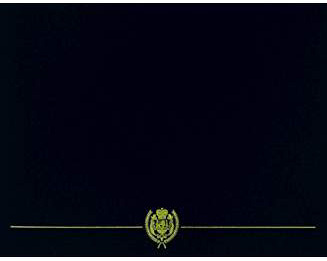 Until 1981, the accomplishments of joint activities could only be recognized by Service unit awards. Due to the very nature of those activities and the varying criteria among the Services, it became necessary to establish a means by which joint activities could be recognized. With the JMUA, the Department of Defense provides a consistent means for recognizing such activities. C4.1.3. The JMUA, awarded in the name of the Secretary of Defense, is intended to recognize joint units and activities for meritorious achievement or service, superior to that which is normally expected. The policies and procedures pertaining to that unique award are outlined in sections C4.2. through C4.8., below. C4.2.1. All joint units and activities (as defined in Chapter 1, paragraph C1.2.1.) are eligible for award of the JMUA in recognition of exceptionally meritorious conduct in the performance of outstanding service. However, a unit or activity's outstanding accomplishment of its normally assigned and expected mission is not in and of itself sufficient justification for award approval. Instead, qualifying achievements must be superior to that which is expected under one of the following conditions and should be operational in nature. C4.2.1.1. During action in combat with an armed enemy of the United States. C4.2.1.2. In a declared national emergency situation. C4.2.1.3. Under extraordinary circumstances that involve national interests. C4.2.2. The JMUA shall not be awarded to any DoD activity that has received any other unit award for the same achievement or period of service. C4.2.3. Only those members of the Armed Forces of the United States who were present at the time and directly participated in the service or achievement for 30 days or more, or for the period cited if less than 30 days, shall be authorized to wear the JMUA ribbon. Members must be permanently assigned or attached by official orders to the joint unit receiving the JMUA. Local commanders may waive, on an individual basis, the 30-day minimum time requirement for individuals (e.g., Reserve personnel on active duty and TDY and/or TAD personnel), who, in the opinion of the commander contributed directly to the achievement cited, and were assigned on official orders to the awarded unit during the approved time frames. C4.2.4. A JTF headquarters may be awarded the JMUA. If a JTF headquarters is awarded the JMUA, every member permanently assigned or attached TDY or TAD to the JTF headquarters is eligible to wear the JMUA ribbon. Assigned and/or attached (including TDY and/or TAD) status is determined by official orders that specify the JTF headquarters as the duty unit. C4.2.5. Service units or individuals deployed in support of a JTF, but not assigned and/or attached to the JTF by official orders, are not eligible for the JMUA, even if they are under the operational control of the JTF. The Services may award appropriate Service unit awards to their units assigned and/or attached to a JTF. C4.3.1.1. Name and location of unit, activity, or organization. C4.3.1.2. Inclusive dates for the award. C4.3.1.4. A narrative justification containing specific and factual data about what the activity accomplished, how it was done, what the benefits or results were, and why or how the achievement or service significantly exceeded normal unit duty performance. The narrative justification shall not exceed three single-spaced typewritten pages. Supporting documents, as appropriate, may be attached. C4.3.1.5. A listing of qualifying Service members attached but not permanently assigned, detailing full name, rank and/or rate, social security number, branch of Service, and permanent unit at the time of the award period. That list must be sorted or grouped by branch of Service. C4.3.2. Award recommendations shall be endorsed by commanders at all levels. C4.4.1. Recommendations for joint activities that report directly to an OSD Principal Staff Assistant or to the Secretary of a Military Department, for which he or she has been designated the "Executive Agent for the Secretary of Defense," shall be forwarded through those channels and to the Chief, Military Personnel Division, WHS. DA&M will forward a copy of the approval letter to the Deputy Assistant Secretary of Defense (Military Manpower and Personnel Policy) (DASD(MPP)), Office of the ASD(FMP). C4.4.2. Recommendations for joint activities that report directly to or through the Chairman of the Joint Chiefs of Staff shall be forwarded to the Director, Joint Staff. C4.5.1. The ASD(FMP), or designee, for activities that report directly to an OSD Principal Staff Assistant or for which the Secretary of a Military Department has been designated the "Executive Agent for the Secretary of Defense." ASD(FMP) delegated authority to Director, Administration and Management, to approve or disapprove JMUA and grant exceptions to policy for award recommendations under the Deputy Under Secretary of Defense for Personnel and Readiness Memorandum (reference (m)). C4.5.2. The Chairman of the Joint Chiefs of Staff, or designee, for activities that report directly to or through the Chairman of the Joint Chiefs of Staff. A Member of Congress can request a review of a proposal for the award or presentation of a decoration (or the upgrading of a decoration) that is not authorized to be presented or awarded due to limitations established by law or policy for timely submission of a recommendation (reference (a)). C4.7.1. The JMUA shall have precedence after the Presidential Unit Citation, but before the Military Service unit awards. C4.7.2. An oak-leaf cluster is authorized for wear for each additional award of the JMUA. C4.7.3. Civilians within an organization awarded the JMUA will be awarded a civilian JMUA lapel pin. C4.7.4. Streamers shall be obtained by the unit through normal supply channels. Eligible units of a JTF awarded the JMUA are authorized streamers in accordance with their Service's policies. Requests for exceptions to policies or determinations about eligibility for the JMUA shall be forwarded through appropriate command channels to the Chief, Military Personnel Division, Personnel and Security Directorate, WHS. WHS is authorized to approve, disapprove, and grant exceptions to policy for JMUA under the Deputy Under Secretary of Defense for Personnel and Readiness Memorandum (reference (m)). The DJS has authority to grant exceptions for those units who report directly to, or through the Chairman of the Joint Chiefs of Staff. Disapproval of requests may be made at any level having an established command or staff position authorized in the grade of O-8.